On Sunday morning, I ran my second 5k race of the month! 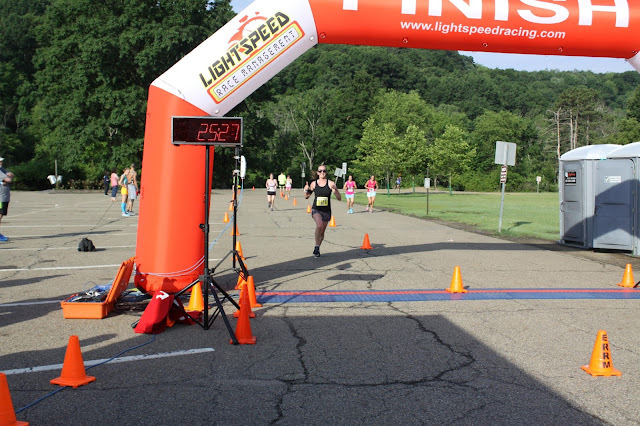 This was a small, local race held at North Park called the Peace, Love, Run 5k. 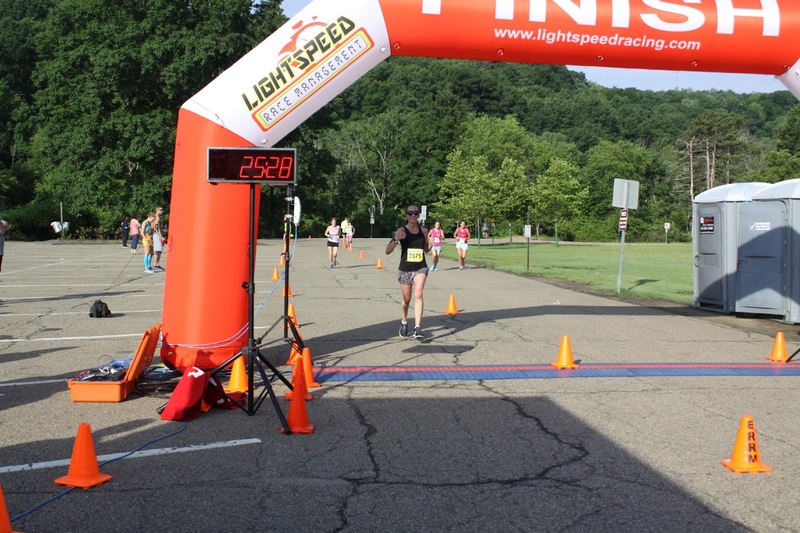 There was also a half marathon that started at 7:00, and the 5k started right on time at 7:45. I was happy to not be running the half, because it ended up being a hot and humid morning! I've done quite a few races at North Park, and most of them follow the same course. We start at the Boat House, run down the tennis courts road, and turn left onto Lake Shore Drive. This section of the park has some rolling hills, but isn't too challenging. I started out about halfway back in the crowd, and spent the first half mile settling into a pace and getting out of the pack. My legs felt loose and warmed up thanks to my two mile warm-up! The course continues down Lake Shore Drive and has a turn-around at 1.5 miles. At this point, there were a lot of half marathoners finishing up their first lap of the park. There were also a lot of non-racers out walking and running, so it was hard to figure out who was in my race. I just picked out a person in front of me and tried to pass them. This helped to keep my mind focused and keep up my pace! At the turn around, there was a water station, so I stopped to grab some water and dump it on myself. I was really starting to feel warm, so this helped a lot! The race finishes up on the tennis court road, with the finish line being right in front of the Boat House. When I passed the second mile marker, I noticed a female in front of me, and tried to chase her down. At this point, I was getting pretty tired and hot, so trying to catch her really helped. As we rounded the corner to the tennis courts, I caught up with her and slowly took the lead. I put in everything I could to pass her! As I rounded the final corner, the announcer said that I was the second female, and the woman I passed was third. I was so excited to finish in the top three overall, and thanked the woman for pushing me the final mile. After I got some water and a banana, I checked out the results and found out I actually got third place overall and the other woman got fourth. I felt a little guilty for passing her at the end and kicking her off the podium! I finished up my workout by running back to my car with some heavy legs. I wasn't able to stay for the awards ceremony (I think they might do the half marathon and 5k awards together, so it would have been a while), so I'm not sure if I got a trophy or prize. Just knowing I got third place was good enough for me! Awesome job, even with that crazy sun!! Yeah girl! Such a consistent pace too :) Congrats on getting third! I always say this, but you ROCK! You are incredible, and congrats on 3rd place! You're so sweet :) Thanks Elle! Awesome! Congratulations on the 3rd Overall!! Great job Gretchen! I'm super upset I had to miss this race this year, but you crushed it! Congrats! I bet you were glad to do the 5K that day instead of the half! I know I would have been! Awesome job, those are great times! And impressive for having such similar splits. You get a medal in my book! Thanks San! I was super happy about it! woah you're a beast! Congratulations, lady! Yeah!!! That's awesome! Nice work speedy!!! Your splits are so perfect! I am in awe! Congrats on taking third, that is awesome! I was shocked too! Haha thanks Heather! Congrats, Gretchen! Racing on a hot and humid day when it's not your goal race deserves a huge kudos on its own. Awesome job hanging in when it got tough and turning things up at the end. Love that your hard work paid off by taking the #3 spot!